Ramona Mixed Martial Arts is a Martial Arts School offering Jiu-Jitsu (Jujutsu/Jujitsu), Judo, Karate, Kempo/Kenpo & Kick Boxing classes in Ramona, CA for kids, men and women. 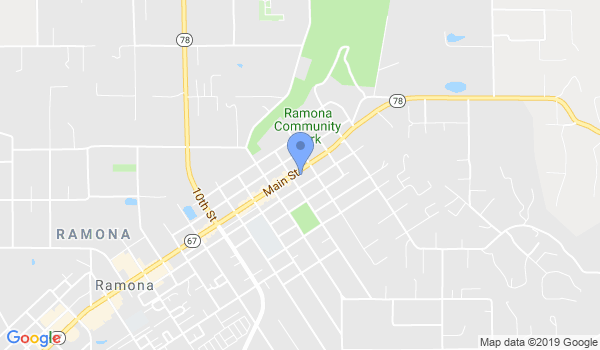 Ramona Mixed Martial Arts is Located at 558 Main St..
View a Location Map, get Directions, Contact Ramona Mixed Martial Arts or view program details below. If you are a student at this school, help your local Martial Arts Community by writing a Review of Ramona Mixed Martial Arts. You can also help your school by sharing it on Facebook, Twitter, Google+, Pinterest etc. Teen to adult (14- ) 7-8:15 Tuesday and Thursday. Our class schedule and training sessions are broken down into four weeks. Week one, each student will learn new forms such as kata, attacks, strikes and defense. Week one also combines strength training and exercise. Week two is a review of what was taught week one and previous weeks. Combined with exercise. For kids class we practice SCREAM CIRCLE. A program developed by Sensei Schrader and his assistant. Week three is floor or ground techniques such as grappling and wrestling. Week four is sparring and AGGRESSOR/DEFENDER Another program developed by Sensei Schrader. Each class consists of strength training prior to the training. We believe and promote physical strength. Would you like more information on hours, classes and programs available at Ramona Mixed Martial Arts? Please contact the school with your questions. Update the details, Write a Review or Report Error of Ramona Mixed Martial Arts.